In March of 2018, a study was conducted of the Niobrara using machine learning for multi-attribute analysis. Geophysical Insights obtained 100 square miles of seismic data covering the Niobrara in northeast Colorado from the Geophysical Pursuit and Geokinetics multi-client seismic library. 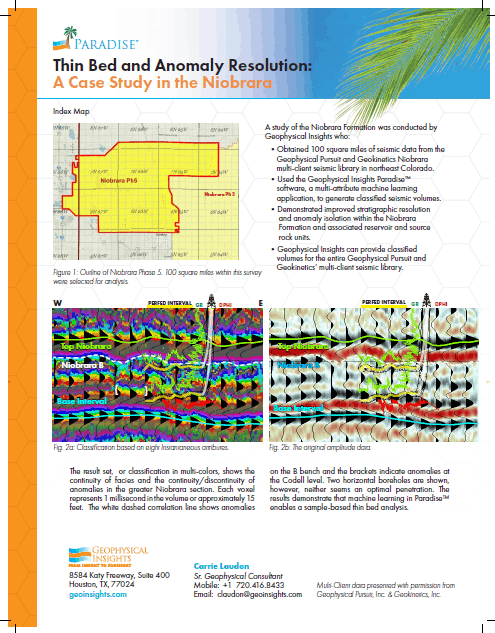 Using Paradise®, a multi-attribute learning application, geoscientists generated and classified seismic volumes, the results revealing thin beds below seismic tuning and anomaly resolution not practical with traditional interpretation methods. In total, the results of that classification demonstrated dramatically improved stratigraphic resolution and anomaly isolation within the Niobrara Formation and associated reservoir and source rock units. 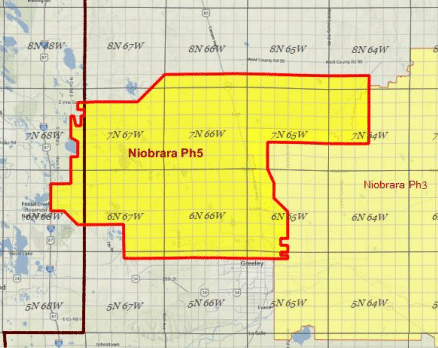 Figure 1: Outline of Niobrara Phase 5. 100 square miles within this survey were selected for analysis. 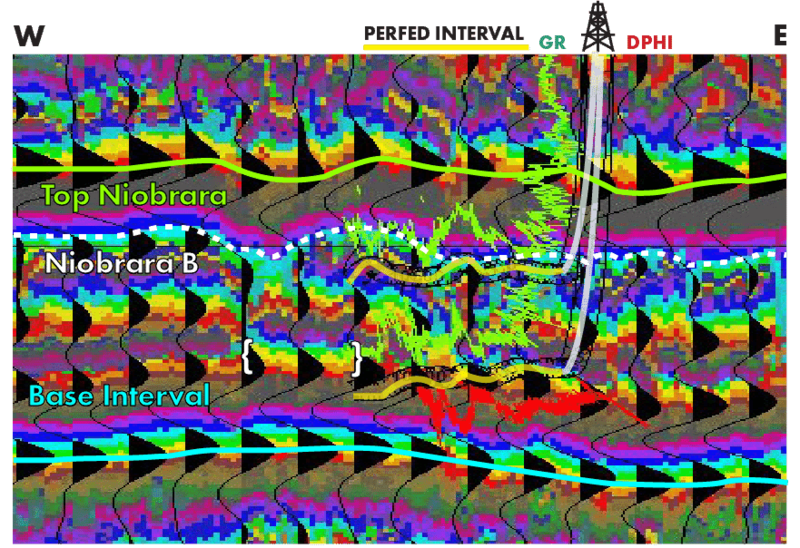 The result set, or classification in multi-colors, shows the continuity of facies and the continuity/discontinuity of anomalies in the greater Niobrara section. Each voxel represents 1 millisecond in the volume or approximately 15 feet. The white dashed correlation line shows anomalies on the B bench and the brackets indicate anomalies at the Codell level. Two horizontal boreholes are shown, however, neither seems an optimal penetration. The results demonstrate that machine learning in Paradise enables a sample-based thin bed analysis. Figure 2a: Classification based on eight Instantaneous attributes. Figure 2b: The original amplitude data. Figure 3: Self-Organizing Map (SOM) classification with low probability (<10%) anomalies (white) in the greater Niobrara section. The results may indicate concentrations of hydrocarbons in organic-rich shales. Anomalies also may show migration up section along faults from the Niobrara into the Sharon Springs. Niobrara B anomalies are best developed in elevated areas. Additional well data can corroborate anomaly interpretations. Figure 4: Interactive 2D Colormaps use transparency (left and see inset) to highlight and extract anomalous behavior or particular facies. 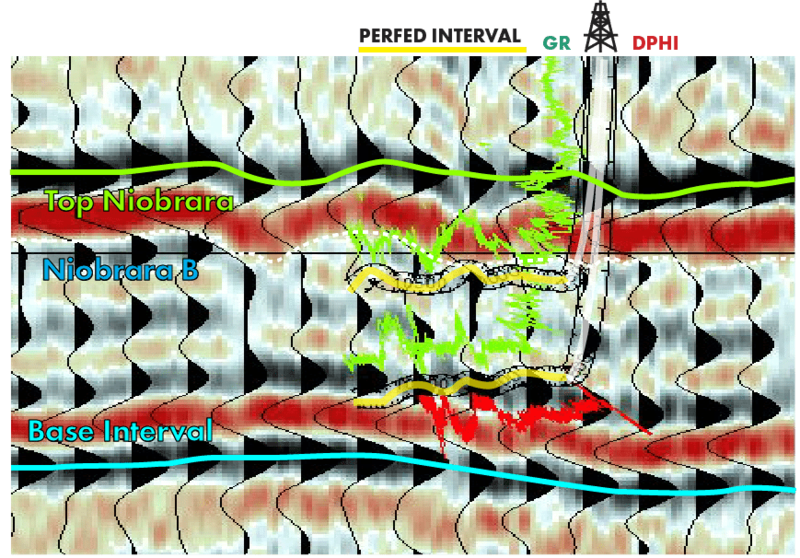 Note that the wellbore intersects a fault (white arrow) and misses the bracketed anomaly. Principal Component Analysis (PCA) was used to identify and quantify the key attributes in the seismic volumes. The SOM process was then applied on these attributes to learn and classify the data. The neural topology, shown in the Paradise 2D Colormap, establishes the number of classes in the resulting seismic volume. The classification volumes show geologic features and anomalies that can aid in well location and development planning. Figure 5: Map of structural features identified in this Niobrara volume. Near vertical graben-style faulting predominates in the upper Niobrara..